Schoolchildren at Tillingbourne Junior School have unveiled a piece of art, which was created by Year 6 pupils and funded by the £1,000 first prize donated by Seymours Independent Estate agents after Freya Treeby-Goodall, a year 6 pupil, won the estate agent’s Christmas Card design competition. 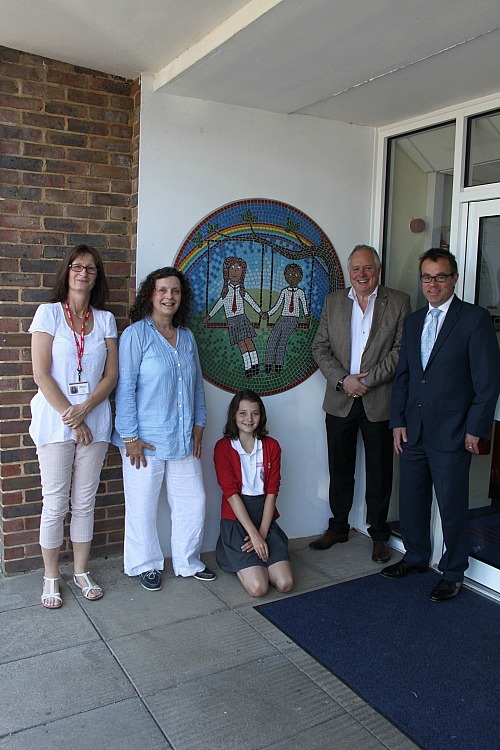 The mosaic, which is based on an amalgamation of designs by Year 6 pupils, was created in partnership with The Mosaic Studio, headed up by renowned British mosaic artist and award-winning designer Paul Siggins. Guided by Paul and his assistant, 15 year 6 pupils, including Freya, took a day to complete the mosaic. Freya, who was selected from hundreds of entrants and announced as the winner in January, scooped the top prize after submitting a hand-drawn design depicting Father Christmas on the hunt for a new property with Seymours. The mosaic, which is over a metre in diameter and made up of over 1,000 pieces of vibrantly coloured, hand cut glass tesserae, has been installed as a colourful and joyful welcome at the front entrance to the main building for everyone to see and enjoy.